The 2017 Lexus RX 350 wears the new face of Lexus while retaining the comfort, luxury and reliability RX owners have come to expect. The 2017 lexus rx electric vehicle qualifies for a federal tax credit of up to $7,500, effectively reducing the net base price. 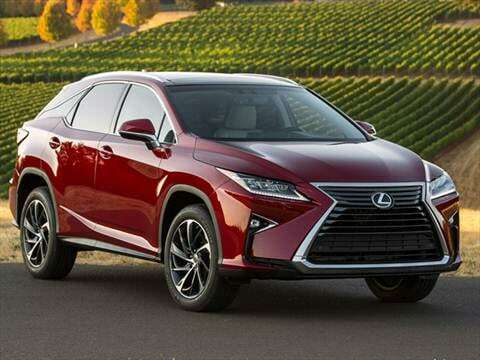 Still dominating the segment it created, the 2017 Lexus RX 350 luxury SUV continues to give customers the exact blend of performance and comfort they’ve come to expect, while giving competitors fits as they try to keep up. While not as driver-oriented as a BMW X5 or Mercedes-Benz GLE, the 2017 RX 350 and RX 450h hybrid provide more than acceptable levels of acceleration and handling, and still outshine almost every other luxury SUV in the areas of reliability and resale. The RX 350 isn’t as roomy as a Lincoln MKX or Audi Q5, but it’s loaded with advanced safety features optional on most other luxury brands. Those who don’t mind sacrificing ride comfort for performance will find the F Sport trim quite alluring. If you’re seeking a 5-passenger luxury SUV that delivers a smooth ride, comfortable cockpit and loads of luxury and safety features, then the 2017 Lexus RX 350 and RX 450h hit the mark. Money savvy consumers will appreciate the RX’s excellent resale values and low maintenance costs. If you’re looking for more power with your sport suspension, you’ll have to look toward the Mercedes-Benz AMG or BMW M models for that. If you need the ability to venture off-road, a Land Rover Discovery Sport or Jeep Grand Cherokee makes a better choice. Lexus’ 2017 RX 350 receives Lexus’ Safety System + with automatic emergency braking as standard equipment, while the RX 450h gains standard blind-spot monitor and rear cross-traffic alert. The F Sport can now be ordered with front-wheel drive (FWD), while the hybrid gains standard all-wheel drive (AWD). Lexus recently overhauled the entire RX line giving it a more aggressive exterior and a more fluid interior design. Changes were made to the suspension and drivetrain as well, but the 2017 Lexus RX 350 remains a luxury SUV that places an emphasis on comfort and confidence over blistering performance. We’re not saying the Lexus can’t handle tight turns or twisting back roads, but if you’re seeking razor-sharp reflexes, a step up to the F Sport trim is in order. Equipped with Lexus’ selectable drive-mode system, the F Sport adds a Sport S+ setting that firms up steering feedback and quickens throttle response. The RX’s V6 is both powerful and impressively smooth, matched to an 8-speed automatic that should be the standard by which all automatics are judged. The RX 450h hybrid combines an electric motor with the V6 delivering even more horsepower and torque with superior fuel economy. The 2017 Lexus RX 350 and RX 450h’s power-operated rear hatch can be activated simply by placing one’s hand near the Lexus badge. You’ll love it for the convenience and your kids will love it when you tell them you’re using the Force for good and not evil. With the F Sport package teamed to the hybrid platform, the RX becomes a performance SUV with exceptional handling and fuel-economy numbers of which its rivals can only dream. The 2017 Lexus RX interior boasts its own smooth style. Last year’s redesign saw the gear selector moved from the center dash to a spot in the console below. The design opens space in the dash for easy-to-access climate and audio controls. The mouse controller just south of the gear selector is easier to operate. The seats are plush, and there is plenty of legroom in back. Beware of rear blind spots from the narrow roof design. Cargo space is impressive, with over 18 cubic feet behind the rear seats. That number expands to over 56 cubic feet with rear seats folded. The Lexus RX has always been well-equipped, and the latest model is no different. Even a base RX comes with a power tailgate, a 10-way power-adjustable driver’s seat, a power-adjustable steering wheel, a faux-leather interior, rain-sensing wipers, dual-zone climate control, a rearview camera, a HomeLink garage-door opener, 18-inch wheels, and the Lexus Safety System + with automatic emergency braking, adaptive cruise control, auto high beams and lane-departure alert. The standard infotainment system includes an 8-inch command screen, 9-speaker audio with USB, Bluetooth, Micro SD card slot and auxiliary input, and Siri Eyes Free for Apple iPhones. All-wheel drive is optional on the RX 350 and standard on the RX 450h hybrid. F Sport models can now be ordered with front-wheel drive. Other options include leather seating, a power moonroof, a heated steering wheel, heated/ventilated front seats, the touch-free tailgate, navigation, an upgraded 12.3-inch display, and a fantastic-sounding 15-speaker Mark Levinson audio system. F Sport models add 20-inch wheels, paddle shifters, adaptive variable suspension, and unique front and rear fascias. A rear-seat entertainment system with DVD player and dual screens is also available. The 2017 RX 350 uses Lexus’ tried-and-true 3.5-liter V6. The engine has recently been enhanced with new cylinder-head design, reshaped intake ports and more. The result is a bump in horsepower -- from 270 to 295, and improved fuel economy. Unlike some luxury SUV rivals, this one runs just fine on regular 87-octane unleaded gasoline. The most efficient Lexus RX remains the 450h hybrid, which pairs the 3.5-liter V6 with a battery-electric powertrain and standard AWD. Like a standard Prius, no plugging in is required, but premium unleaded gasoline is recommended. The 2017 RX 450h has total output of 308 horsepower and delivers up to 31 mpg. The Lexus RX’s towing capacity is 3,500 pounds. The 2017 Lexus RX 350 has a Manufacturer’s Suggested Retail Price (MSRP) just under $44,000 for a FWD model. AWD costs an additional $1,400, while the Lexus RX 350 F Sport begins just under $50,000. Hybrid Lexus RX 450h models begin just over $54,000. The priciest Lexus RX is the 450h F Sport, starting just under $57,500. Adding options to any model can increase the bottom line by thousands. At these prices, the Lexus continues to significantly undercut German rivals such as the Mercedes-Benz GLE and BMW X5. It is in line with the 3-row Acura MDX, and above the starting prices of the Lincoln MKX, Volvo XC60 and Infiniti QX50. Check the KBB.com Fair Purchase Price to see what others in your area are paying for their new RX. In addition to having a stellar track record in reliability, the Lexus RX has a tradition of holding its value extremely well. Very easy to live with. Does everything well. Great road car. I love the RX 350. Total style, comfort, and luxury. From the quiet interior to the gorgeous exterior, there's nothing not to love. This is my third Lexus and this one is by far the most impressive.